For me, autumn is even more of a new start than January. There's a definite change in climate and it's the start of a brand, spanking new season. I love sewing for different seasons and I'm looking forward to working with different weights of fabric, longer sleeves, new styles etc. The downside is that I've also got to fit in lots of craft fair sewing as I've committed to three Xmas fairs, two of which are enormous. So my autumnal sewing list is realistically an autumn AND winter list. 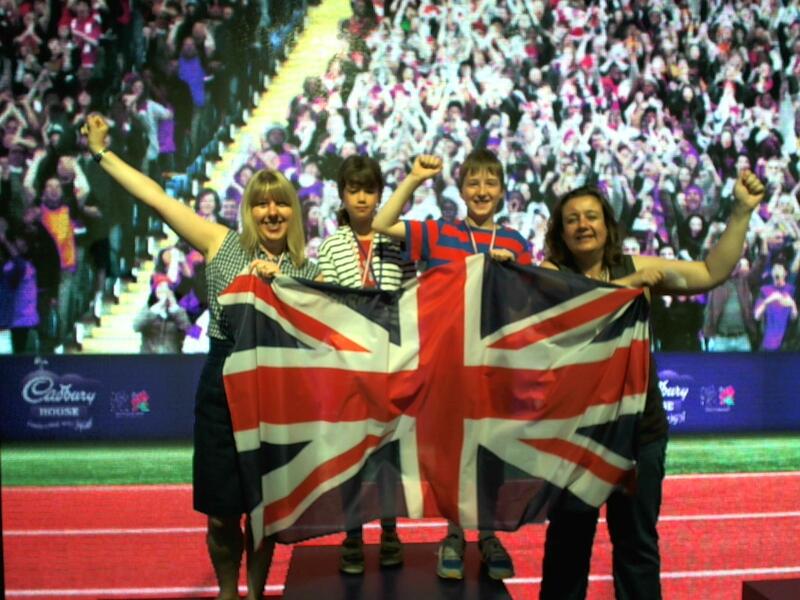 Here goes…. Top of the list and something I've been keen to get my teeth into all summer. My fabric and lining are cut and I've prepped the front coat piece to start working on my bound buttonholes. As soon as school begins next week it's all systems go. 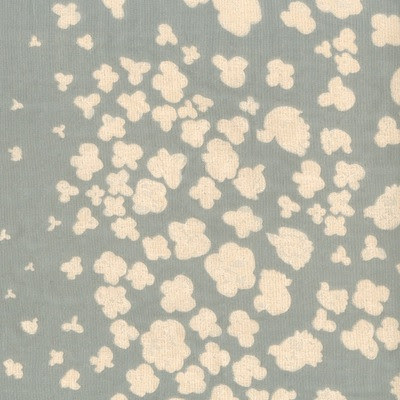 I'm planning on using this beautiful, grey double gauze fabric from Misformake. I've sewn with double gauze before, here and here and really like the texture. Plus it's a magic fabric, it keeps you cool in summer and cosy in winter. I think it will be a perfect match for the Alma blouse. If I get the fit right, I may try a long sleeved version too, but in a less expensive fabric, long sleeves demand a ton of fabric and double gauze isn't a cheap option! I've been mightily swayed by all the lovely Kelly skirts popping up on blogs recently, but also have my eye on this one seam skirt pattern. I bought the pattern after seeing Kestrel Finds and Make's cord version and am sorely tempted by this red polka dot cord from Dragonfly Fabrics. It's expensive though, which is why I'm thinking a skirt. I'll have to shorten it by about a foot, so could probably get away with just buying one metre. On the other hand, if I do well at my craft fairs, maybe I could stretch to a couple of metres of it... In which case, it would be perfect for version A of this cute as a button dress pattern, gifted to me by Debi. And finally, I'd like to sew something with a knit fabric, but something a bit more casual than my red Joan dress this time. Maybe this simple, classic dress pattern which Casey kindly sent me? Bound buttonholes courtesy of Did You Make That? A few weeks ago, Karen from Did You Make That? asked if I was interested in attending a small teaching workshop she was planning on bound buttonholes. Was I interested? Was I?????? I've been dreading making the bound buttonholes for my Abbey coat, so the timing couldn't have been more perfect. Karen has all the qualities you would expect of an excellent teacher: patience, bucket loads of encouragement and extraordinary attention to detail. Each of her 'students' was given pre-cut sections of fashion fabric and lining fabric to make the bound buttonholes with (I brought my own fashion fabric as I wanted to see how my actual coat fabric would behave), plus a professionally written and photographed ebook for us to refer to. Yes, I'll repeat that in case you can't quite believe what you're reading, a professionally written and photographed ebook…. Picture stolen from Did You Make That? She took us through each step, leading by example and not moving on to the next stage until she was satisfied we all understood what we were doing. At no time did I feel like I was winging it, which is usually par for the course with me. I still can't quite believe my bound buttonholes actually look like bound buttonholes! My buttonholes just after they'd been turned the right side round, apologies for the rubbish colour. This woman is BORN to teach a sewing course. Seriously, if anybody who runs courses is reading this, you have to snap her up. Being taught how to make bound buttonholes is not an opportunity you're given every day and as such, is worth its weight in gold. I for one would happily have handed over large sums of money to learn what I did yesterday. As it was, Karen very generously shared her knowledge with us out of the goodness of her heart. I'll stop there or I'm likely to start blubbing with gratitude. Back in June, I was partnered with Cindy from Cation Designs as part of Kerry's Summer Sewing Swap. We became blog friends via e-mail and I became an instant fan of the beautiful, often vintage-inspired dresses she makes. She's already made an awesome dress from the pattern I included in her swap package. Imagine my delight when she contacted me to see if we could meet up during her UK holiday this week. Wahay, I couldn't wait! So this morning, I met Cindy and her charming husband Eric at Portobello Road market, where we spent the next few hours rummaging around vintage clothes stalls, my favourite buttons and trims stall and the countless other little treasure troves and shops that the market is famous for. I managed to pick up two cards of lovely vintage buttons from the button man, along with a one-off present for my mum which I'll have to keep quiet about in case she's reading…. Cindy bagged two lots of gold trim for a forthcoming make and was pondering a giant cat-print scarf as I left her. The picture above shows us in the Cloth Shop soaking up the fabric gorgeousness. I knew we'd get on well as we'd clicked immediately during our e-mail exchanges and I wasn't wrong, she's just lovely! We managed to effortlessly chat non-stop the entire time. It's really quite surreal - a few weeks ago, Cindy was a total stranger on the other side of the world, yet there we were today, enjoying a fabulous morning of vintage shopping and tea drinking. 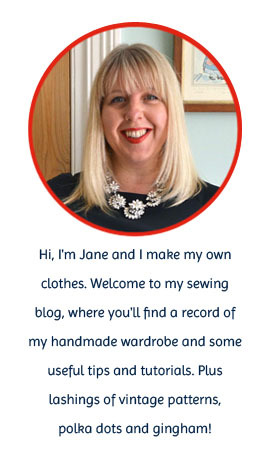 That's the beauty of sewing bloggers, it's satisfaction guaranteed every time! What does 1980 conjure up for you? I realise many of my readers weren't even born in 1980 but stay with me. For me, 1980 was the year I bought my first two singles (Another Brick in the Wall by Pink Floyd and Brass in Pocket by The Pretenders), when Look-In was my comic of choice and my hair was lovely, long and straight, not yet subject to the horrors of a 1980's perm. 1980 was a big year in many ways - it was the year my baby brother was born and the year I had my first sewing lesson…. Why am I wittering on about 1980 you might ask? Well, Karen's recent post about revisiting the first garment she ever made got me thinking. I realised that the first thing I actually made myself was in a sewing lesson in 1980. My sewing teacher was firmly in the 'no praise, but plenty of criticism and public humiliation in front of the whole class' camp, so the memories aren't especially golden. Yes, Miss Dracup, I'm talking about you… We each had to make an apron in readiness for our cookery lessons the following year. Mine was navy blue gingham (naturally) with JANE painstakingly chain stitched across the front. I really, REALLY wish I still had it, I know for a fact I'd wear it every day - maybe I should recreate it? The style comprised very long straps that criss-crossed across the back, through loops at the side and tied at the back. Now this is going to make me sound about 100 years old, but my school only had two electric machines back in 1980. The rest were treadles, set into tables. The afore-mentioned straps were about two metres long and one thing I distinctly remember about sewing them was building up speed on the treadle machine, pummelling away with my feet like a loony! Yet despite the Victorian equipment and dragon of a teacher, there were lots of things I learnt in those school sewing lessons that came flooding back to me nearly 30 years later, when I took my first sewing class as an adult. So, back to the original point of this post, the first garment I made as an adult was a very simple A-line skirt. It was my mum who persuaded me to make a simple skirt rather than a complicated wrap dress and I'm glad she did. The relative ease with which I made it gave me a good dose of confidence at the very start of my sewing journey. It's too hot to model the skirt today so here's an old photo of it. Looking back now, I'm astounded by how confident I actually was. I used New Look 6843 which calls for a standard zip and has no mention of a lining. With the help of my teacher, I went straight off piste and inserted an invisible zip without an invisible zip foot AND a lining. I can't believe how cocky I was or maybe it's just as Karen says, "ignorance and lack of fear can go a long way." Exactly. Looking at the skirt today, there are several dodgy bits that show it for what it is - a first garment. If I was making it again, I'd give the inside waistband a neater finish (it's just zig-zagged and sewn down) and the same goes for the hem. The seams on the lining were also unfinished which I probably wouldn't be happy with today. Despite this nit picking, I've worn it a lot because it's such a great basic shape and colour. Flush with the success of that first skirt, I then went ahead and made another from the same pattern without the guidance of my teacher! Like the first one, it's got a perfectly inserted invisible zip, and is fully lined in daring red, but this time the lining seams are finished. Interesting, maybe it was my teacher who told me it wasn't worth finishing them first time round? I can't remember. Again, I'm astounded at my daring - instead of a separate waistband, I've added my own strip of bias binding to finish the top edge. How did I think of that?! All in all I'd give myself a hefty pat on the back for my first adult efforts. Good work Jane. Sadly, I can't ever remember hearing these words in 1980, but thankfully it didn't put me off and I'm grateful I was taught the basic skills at the age of eleven. This 1950's blouse was my last stab at dressmaking before the school holidays kicked in and my sewing effectively ground to a halt. I found this darling little Style Print pattern at the South Bank Vintage Festival last year. 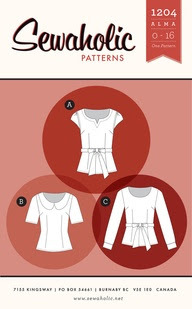 The difficult part wasn't sewing up the blouse, it was deciding which option to go for. In the end, I went for View B: a buttoned front, short sleeves and lovely collar detail, isn't it cool? It's such a great 1950's detail. It's the first time I've used a Style Print pattern and the clear directions and sturdy pattern paper were a delight. I'll definitely be looking out for more of them. I used a linen mix polka dot fabric I found at the bottom of a remnant box at a vintage fair. Like the cotton pique I used for my first Peony dress, this fabric is quite drapey and my suspicions were that it would sew up larger than a normal woven fabric because of the extra stretch. I was right. View B isn't supposed to have any darts, but looked positively sack-like when first sewn without them. Handily, there were darts positioned on the same pattern piece for the other views. So I added two sets of darts to both the front and back. The back fitted perfectly, but I had to remove one set of front darts to avoid button-gaping - the final fit is absolutely fine. I was also able to use up the last of my vintage shell buttons, the rest of which adorn the back of my Roobeedoo top. Although this blouse looks fine tucked in, I made it to wear in the holidays, and because of the darts, I can wear it untucked…. with shorts. I can't actually believe I'm typing these words and showing these pictures. Eighteen months ago I wouldn't show my bare knees and didn't even possess a pair of shorts. I had it in my head that it was somehow against the law for a woman over 40 to reveal her knees or wear shorts or an above-the-knee skirt. It's not that I've got issues with my legs or anything, I just felt I was a bit past it. Well, the skirt problem was soon solved thanks to the super flattering properties of the Colette Patterns Beignet and Ginger skirts. Fast forward a few months and I now also own a pair of shorts - Banana Republic rather than me-made I'm afraid, but hey, it's a start. Banana Republic trousers fit me perfectly and I knew a pair of shorts bought there would be way more flattering than anything I'd make myself. And you know what? I like these photos, they don't have me running for the hills, and that's the main thing. I blame sewing blogs. They've got a lot to answer for in terms of confidence building and pushing you out of your comfort zone! I'm very aware of what suits my shape and won't sew something that I know will be unflattering. But… since I started sewing and reading blogs, I've experimented with different styles and made things I've been dying to have in my wardrobe for ages, just because I can. I'll never be wild and mad when it comes to colour, but I'm happy to test out just how many variants of red, blue, grey and turquoise can be found in the world. Some choices I regret, but hand on heart, I'd say I wear about 80% of my handmade clothes on a regular basis, so something must be working. Olympic fever - and giveaway winner! 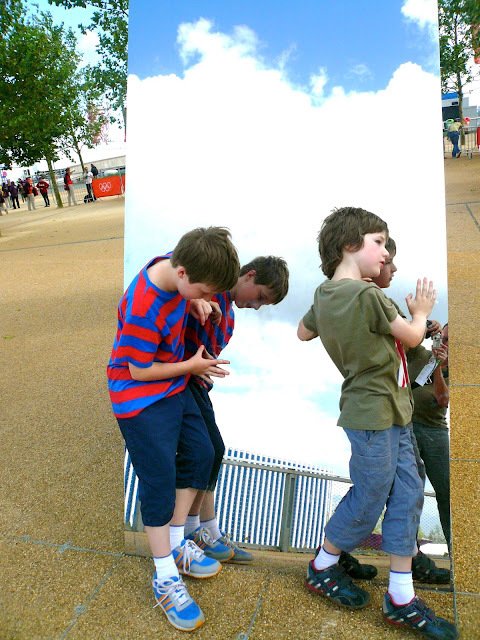 At the Olympic Park.... aren't the flowers lovely? Yesterday, the rest of the family wanted to visit the seaside and I helpfully suggested Whitstable, as it just happened to be the same day as the Seaside Brocante Vintage Fair. What an amazing coincidence. Whilst the boys were busy on the beach, I hot footed it up the High Street and managed to bag two pieces of vintage fabric, a lovely little sugar bowl and these tiny red tins. Have you ever seen anything more destined to be mine? 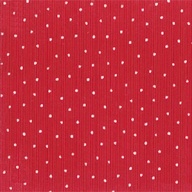 Red polka dot mini tins - MINE! But the best bit was definitely when one of the stall holders, the lovely Hannah from Anchors Aweigh Vintage, said the immortal words, "are you Jane? I read your blog"!!!!!! How flattering and awesome is that? Apparently she recognised my Ginger skirt! Thank you Hannah, you absolutely made my day. Enough chit-chat, we need to talk giveaways. A huge thank you to everybody who entered the giveaway for the Abbey Coat pattern and for your buttonhole feedback. 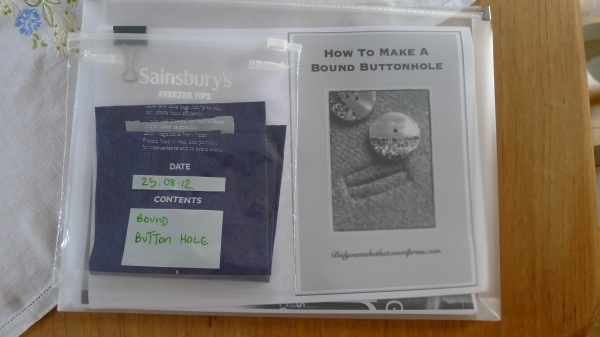 You'll all be pleased to know I'm plumping for bound buttonholes (gulp). The resounding encouragement from all my blog readers definitely helped tip the balance - thank you! Anyway, back to the giveaway, the winner is.....Claire Cooper from Ragbags and Gladrags. Wahay! Congratulations Claire, please e-mail me your address and I'll see you get the pattern as soon as possible. Huge thanks to Annie at The Village Haberdashery for donating such a generous prize.